Play 18 of the best par-5 holes in the world, on the Best Of Par 5 stroke play course free on WGT. The new Best Of Par 5 virtual mash-up golf course features the best par-5 holes from 9 different championship golf courses available on WGT. Warning: this dream course is a monster -- at over 10,000 total yards from the back tees. Below is the detailed scorecard for this amazing new course. And don't worry, because par is 90, scores here won't count toward your overall scoring average. Select this course from the game menu to play now, and for WGT players Amateur Tier and up, play this special monthly tournament where the top 70 scores in each tier earn WGT Credits. The newest "Best Of" stroke play course on WGT features 18 of the best par-5 holes from your favorite WGT golf courses. Play more than 10,000 yards of championship golf for a serious challenge! The Best Of Par 5 course is now available in all game selection menus, and these scores won't count towards your official average, due to the higher par on this course. 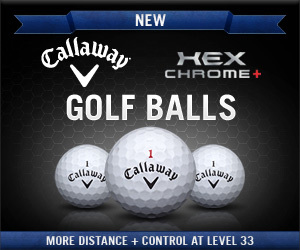 WGT has upgraded all the Callaway Tour balls to the latest Callaway HEX Chrome balls. These new balls have similar top-performance, with more distance, control, or a slower WGT swing meter, in Standard and Vapor Trail options, and are available at the same price as the original balls. 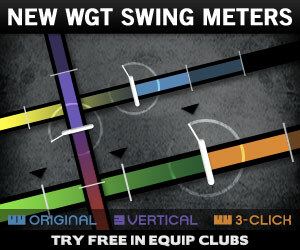 The new MAX Meter clubs help slow down the WGT swing meter, with additional distance and forgiveness. 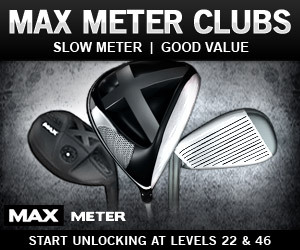 Includes MAX Meter Driver, 3 Wood, Hybrid and Irons, plus a discounted Full Set option. Start unlocking at Level 22 and Level 46 for top players. 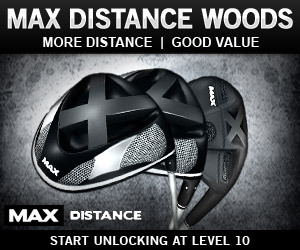 The new MAX Distance Woods offer additional distance at a great value, including MAX Distance Driver, 3 Wood and Rescue. Start unlocking for new players at Level 10. WGT partner, Myrtle Beach Golf Holiday is hosting a special tournament for WGT players in the USA and Canada. 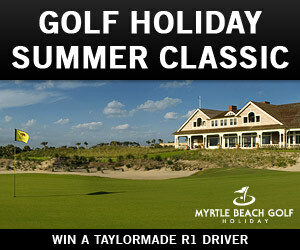 Play the free Golf Holiday Summer Classic tournament on WGT for your chance to get a new TaylorMade R1 Driver prize. One lucky sweepstakes winner chosen at random will win the real driver, not the virtual version on WGT. Play as many times as you want in this 18-hole stroke play tournament on Kiawah, site of the 2012 PGA Championship. *Special tournament is free to enter and runs thru 7/31/13, open to residents in the USA and Canada only. See rules for details. USA players, don't miss your chance at some great prizes in the Korbel Toast Life Challenge tournament on WGT, ending on July 27th. This free closest-to-the-hole online golf tournament is unlimited play on the beautiful Edgewood Tahoe golf course, site of last week's American Century Championship tournament, won by former NFL quarterback Billie Joe Tolliver. Note: this special WGT tournament is limited by law to players from the USA who are 21 years of age or older, and runs now thru 7/27/13. 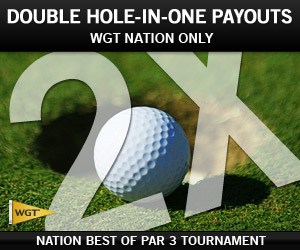 WGT Nation players, earn double Credits in the Nation Double-Double Challenge tournament this week. This free, unlimited stroke play tournament is on the Best of Par 3 course, with 18 different par-3 holes, giving you the most chances to try the Hole-In-One Challenges to earn double Credits. *Special tournament open to WGT Nation members only, now thru Mon, 7/29/13. Championship – Kriztjan was the ultimate champion, shooting 55 and 57 for a 112 final score, followed closely by AgentBrown123 (114), stevenharkin (115) and ragefire (115). Qualifier – 213 top players made the cut at 57 to qualify for the Championship rounds, led by JJ656 and TREMUX. Front 9 and Back 9 Challenges – The Front 9 and Back 9 closest-to-the-hole tournaments were both won by dansamcam with scores of 18.22 and 24.11. WGT and the USGA are notifying the hundreds of leaderboard and sweepstakes prize winners by the end of August. WGT player Kriztjan has won the 2013 Virtual U.S. Open. There were over three million rounds played in the 2013 Virtual U.S. Open tournaments, and the top 213 qualifiers competed in two championship rounds in July. In the first round, Kriztjan posted a 55, the low score of the championship, and backed it up with a solid 57 in the second round, to shoot 112 for the victory. Finishing close behind with strong performances were AgentBrown123 with 57-57 for 114, stevenharkin with 57-58 for 115, and ragefire with 57-58 for 115. They were followed by other top WGT Players with impressive performances on Merion in challenging conditions and the fastest greens. Kriztjan has been playing WGT since Feb 2011 with more than 4,000 ranked rounds and over $23,000 in career earnings. Kriztjan is a member of the Transgressional Country Club, as is AgentBrown123 and stevenharkin, so a very strong performance from this top country club. Congratulations to everyone involved! Merion is now available in all game formats on WGT, including stroke play, match play, skins, country club events, free tournaments and paid tournaments like Ready-Gos. That's right, five years ago today, on July 18, 2008, WGT made our first blog post. 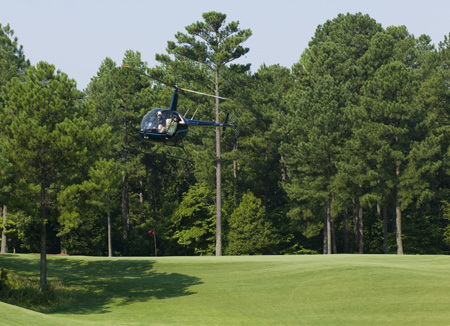 It was about the WGT helicopter photographing the Pinehurst #8 golf course. Interestingly, WGT was back at Pinehurst last month, five years later, shooting Pinehurst #2 for next year's Virtual U.S. Open. This original post was also before WGT released our first full strokeplay course Kiawah Island in October of that year. Five years later, WGT has grown to over 7 million registered players who have played over 300 million virtual rounds on 18 different golf courses. WGT is not only the biggest online golf game, but recently WGT became the largest website in the golf industry, with the most global visitors and most time on site of any other website in golf. Thanks to ALL the WGT Players for ALL their support, and we've got a lot more planned for the next five years to grow the game even more. 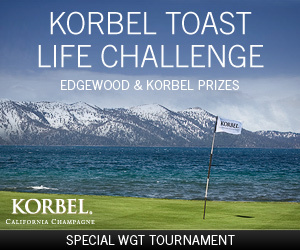 Play the Korbel Toast Life Challenge tournament on WGT for special Edgewood Tahoe and Korbel prizes. This free, closest-to-the-hole tournament is hosted on the beautiful Edgewood Tahoe golf course, site of the American Century Championship tournament this month. Everyone who enters gets a free Korbel virtual golf ball, and three lucky sweepstakes winners will get special prizes, including a grand prize golf trip for two to Edgewood Tahoe, a custom Korbel golf bag and other Korbel gear. Michelin has partnered with WGT to host The Michelin Challenge tournament, featuring a total purse of more than 100,000 WGT Credits. This free stroke play tournament is on Congressional, site of the recent AT&T National PGA Tour event. Play as many times as you want and compete only against players in your same WGT tier, with the top 70 scores in each tier splitting a total purse of more than 100,000 WGT Credits. 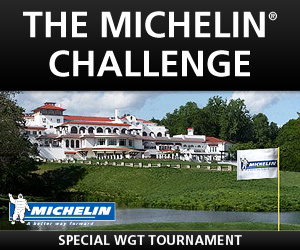 * The Michelin® Challenge tournament is free to enter, open to WGT players in all countries and runs thru 7/31/13. See rules for more details.